Your Startup’s Next Top Software Engineer is out there right now. With experience from Google or skills picked up from Apple, these are the people you want on your team—and talent-mapping is how you can find them, and recruit them. Big companies woo the world’s best talent with huge salaries, a buffet of benefits and brand-name recognition and reputation. How is a new startup ahead of its Series A even supposed to compete? It sure is a challenge to find good candidates for any business, but it requires an extra scoop of determination for a small company. Luring top talent over from big organisations isn’t easy, but it’s doable. Yes, you need to focus on employer branding and making a compelling case for why a candidate should leave their job and come and work for you, but before we get to any of that, answer this: Do you know exactly where your dream talent are working right now? Chances are you have an idea, but wouldn’t it be great to have a way to map all these potential future employees based on their skills, their location, the companies they work at, and their unique job titles? Funny you should ask! There’s no point sending your job description out into the big, wide world and hoping something sticks. You’ve got to pinpoint key candidates to target—but to do that, you need to know where they are. 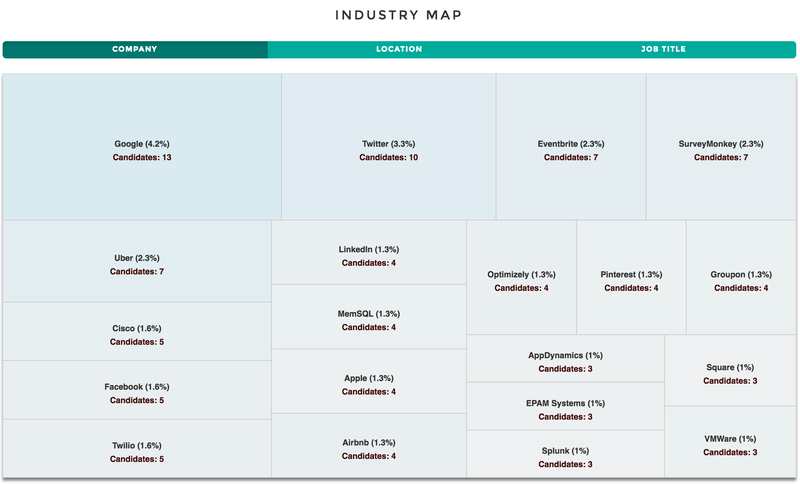 The beauty of talent-mapping is that it literally gives you a map of the top 20 companies with the highest number of matching candidates for you. Now, you know exactly where to aim. Sometimes the best talent are sitting between jobs waiting for their next opportunity to fall in their lap… but most of the time that’s not the case. Your next key hire is already working somewhere else, but they could be open to shifting if an exciting role comes along. This is no time to be shy about it—you’ve got to poach! One of TalentDash’s key features is allowing users to identify exactly which companies they want to take talent from. If you know the best UX leads are at Facebook, then stipulate that in your search query, and we’ll find ‘em! Talent-mapping is part of a long-term recruitment strategy to locate and attract key candidates. But in order for this strategy to be effective, employers need to be constant and vigilant about following industry trends and where talent are moving from and to. Just like a startup, top candidates are fast-moving, quick-learning and dynamic, and if you’re not on top of their movements, then how can you expect to create a solid talent pipeline? These days, you’d be silly to assume a Data Scientist is always called a Data Scientist. Depending on the company or the country the are working in, they might be a Data Analyst, a Data Engineer, or something totally different like Machine Learning Engineer. In order to properly map key talent, include different job titles in your search and then refine your job posting based on the results. 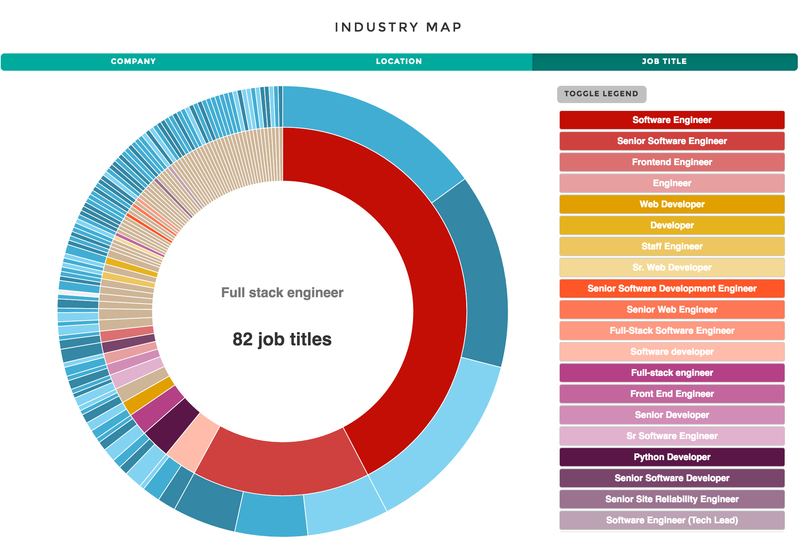 TalentDash’s job title heatmap is the best way to find out what’s really in a name. Did you know that only 61% of global companies have a strategy for passive candidate recruiting? Yet more than 75% of potential candidates are passive, and would not proactively seek out and apply for jobs. Yep, that’s some heavy stuff—and a great opportunity for a switched on startup. Now that you’ve mapped where talent are, it’s time to go in for the kill. Connect with your future hires in a meaningful way. Don’t send them the same old LinkedIn message they’ve probably received dozens of times—create a relationship. Ensure your business has avenues for candidates to explore your culture, your values, your people, your case studies and your professional profile. Boost your employer branding with digital—things like blog, videos, e-newsletters and a strong social strategy. Give key talent a reason to engage with you, and draw them over with your credibility, your unique culture, and a fresh opportunity for talent to learn and grow. It’s time to find talent where they are, not where you think they are. with us to find out more about targeting your talent pool.